I rarely eat out these days. I honestly can’t remember the last time I ate out that wasn’t either a girl’s brunch or special occasion. Of course this doesn’t include when I’m traveling or on vacation. Even when I’m traveling for work, I tend to stick to my usual fare. It’s when I’m on vacation that I live it up. And by that I mean, I indulge just a bit more than usual. It’s a blessing and a curse having a palate for healthy food, but breakfast might be that one exception. Okay, there may be a few others (like French fries), but that’s for another post. When we go on family vacation, breakfast is a big deal. All three of us all look forward to it. We get up early and we’re one of the first family’s to arrive, well before 8:00 am. The hotels where we stay almost always offer a breakfast buffet, something I would normally make huge efforts to avoid! My husband goes straight for the eggs, he’s a big omelet guy. Norah loves to get an enormous bowl of fruit with yogurt. Me? I head for the made-to-order waffles. I love a freshly made waffle for breakfast; always topped with fresh whipped cream and berries, no syrup. I can’t describe the disappointment I feel when there’s no fresh whipped cream for my waffle. It’s literally a deal breaker. Waffles are something I rarely make at home, especially from scratch. My daughter is a pancake gal and waffles hardly seem worth the effort (even though they’re way better). Since making waffles at home is such a treat, of course they deserve some special attention. 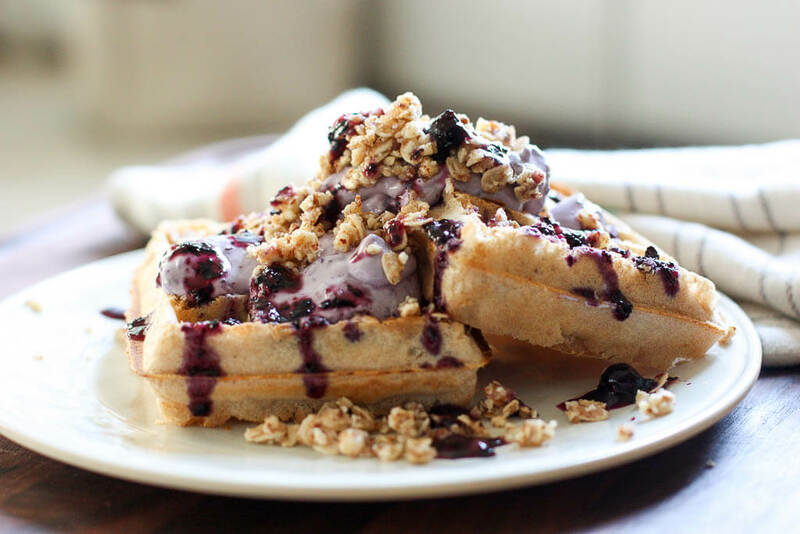 This Belgian Waffle with Wild Blueberry Cream is loaded with deliciousness. 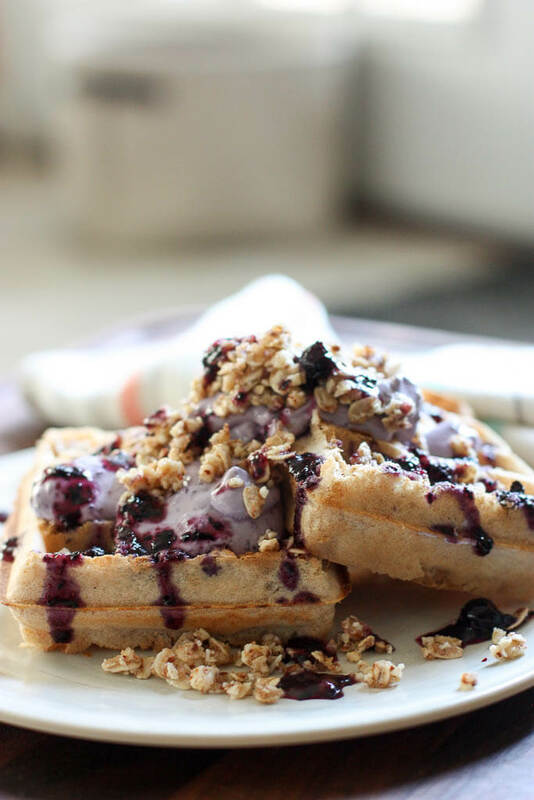 It’s a perfectly cooked Belgian waffle that is topped with a creamy mascarpone Wild Blueberry spread and homemade no-bake granola. You might be thinking where’s the whipped cream? Well, for this recipe I’m actually trying something close, but a little different. My Wild Blueberry mascarpone cheese is a lot like whipped cream (just a little thicker and more amazing) and I thought it would be fun to add some texture with the almond oat granola. My almond oat granola is a secret weapon in many dishes. I love it on top of Chia seed pudding. It has a wonderful crunch and it’s relatively healthy compared to the average baked granola. It’s also a no-bake recipe and there’s really nothing much better than that! 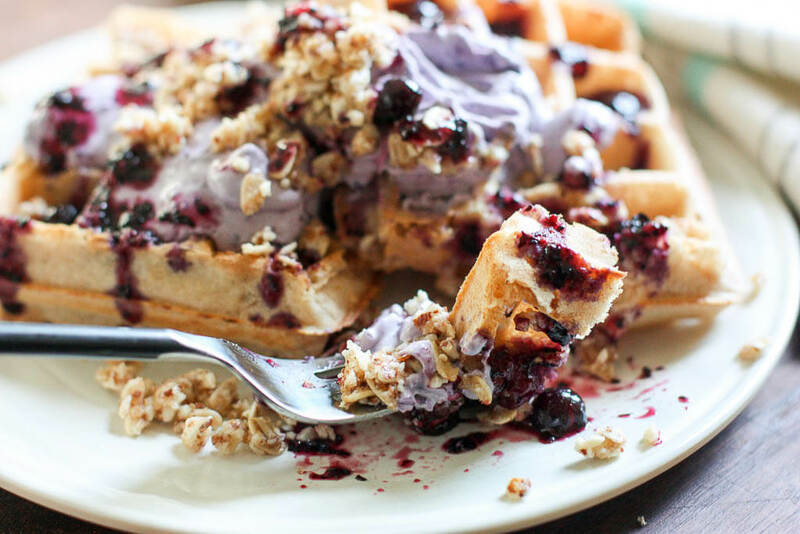 Even with the beautiful Belgian waffle and my no-bake granola, the Wild Blueberries are the star of this dish. 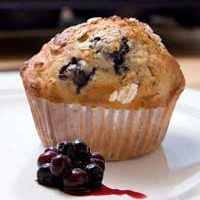 I love their intense color and flavor and the perfect amount of sweetness they add to the mascarpone cheese. I only needed to add a little bit of maple syrup to sweeten it just right. The next time you’re having a waffle craving, why not take it to the next level? 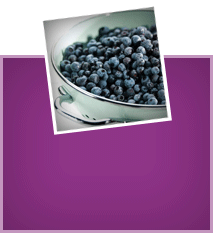 Skip the syrup and try my mascarpone Wild Blueberry cream. You won’t be disappointed. Here’s to made-to-order waffles anytime! Heat Belgian waffle iron; grease if necessary. In a medium sized bowl, whisk together flour, sugar, baking powder, and salt. In another mixing bowl, whisk the milk, oil, egg, and vanilla until well combined. Pour the egg mixture into the flour mixture and stir with a spatula until just combined. Don’t over-mix the batter, it will be lumpy. When ready, pour batter into the waffle iron and cook waffles until they are golden brown, about 3 minutes. Remove from waffle maker and place on plate, but don’t cover (this could make the waffles soggy). Continue making waffles with remaining batter. Blend 1/4 cup of almonds in your blender until they are crushed and resemble large sand granules. Remove them from the blender and set aside in a small bowl. To the small bowl of crushed almonds, add the oats, cinnamon, dash of sea salt and brown sugar, then add the coconut oil and mix with your fingers until it resembles a crumb topping. 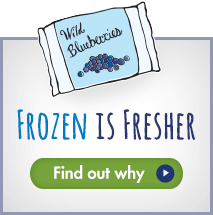 In a blender, blend the frozen Wild Blueberries with the maple syrup and water until it forms a syrup. 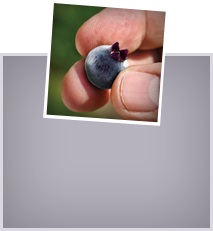 In a small bowl, add the mascarpone cheese and about 2 tablespoons or so of the Wild Blueberry syrup. Whisk the mascarpone cheese until it forms a creamy spread. Danielle Omar is a registered dietitian, clean-eating coach, teacher and cookbook author. She is a passionate food and nutrition educator and founded Danielle Omar Nutrition to support busy men and women on their journey to becoming their healthiest self. An avid cook, she also enjoys sharing plant-based recipes and nutrition strategies on her Food Confidence blog. 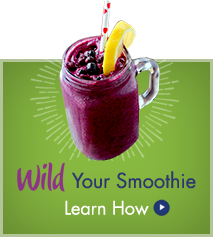 Danielle has a Master’s degree in Nutrition and has been teaching nutrition at the college level for over 10 years. She has contributed to local and national media outlets such as The Washingtonian, The Washington Post, The New York Times, Shape Magazine, and Women’s Health Magazine. Through her private nutrition practice, media work, and group programs, Danielle has successfully motivated hundreds of busy professionals and families to eat confidently and live a healthy life.